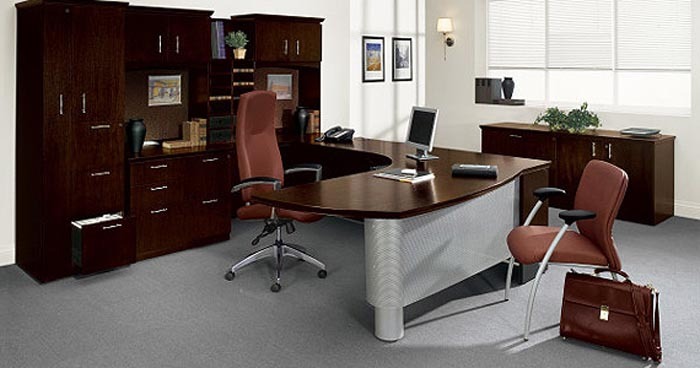 Constructed from grade "A" wood veneers, Easton creates an impressive atmosphere for executive suites and boardrooms. Distinctive detailing, including two edge designs and perforated mesh detail on many components, add a strong and sophisticated feel to your office space. Surface tops and pedestals are available in either a Contemporary or Transitional edge detail to suit your individual taste. All drawers and doors feature a choice of three handle options, including Straight, Round or Bowed designs. An incredible array of worksurfaces, such as Delta Extended Corners, Radius End Islands and Connectable Tables allow you to create the workspace that suits your needs and personality. Versatile and stylish storage units include hutches, bookcases and personal towers, to name a few. Center Storage Tower Hutches are as stylish as they are functional, featuring open storage shelves perfect for important documents or personal items. Complete your office space with beautiful, exquisitely detailed Boardroom Tables, available with installed Power/Data accessories to provide all the communication necessary for today's requirements. Pedestal supported units with 1 1/2" thick tops. 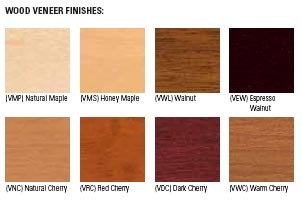 All surfaces constructed of grade "A" veneers in eight warm woodgrain finishes. Choice of two edge styles - Transitional or Contemporary. The edge detail is featured on all tops with a complementary detail on all pedestal fronts and backs. Choice of three handle options - Straight Brushed Nickel, Round Chrome or Bowed Brushed Nickel. 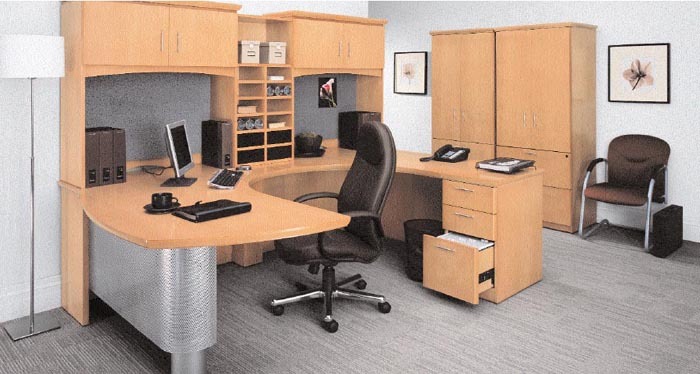 Desks and credenzas feature pedestal construction with a recessed arched modesty panel. Desks and 30"/36" deep returns feature a perforated mesh modesty panel detail standard in Silver. Optional Black modesty panel detail is available at no upcharge. Delta and Radius End Extended Corners and Islands feature full perforated mesh modesty panel in a choice of Silver or Black. All pedestals are full to floor and locking. Pedestals feature Waterloo™ suspensions and five-sided drawers. Black embosed vinyl-wrapped construction drawer sides and bottom are standard. Optional Birch veneer faced plywood drawer sides and bottom with four corner dovetailed construction are available. Locks are standard on all "below worksurface level" drawer and door storage units, with the exception of pull-out tray models. Combination Storage unit is standard with a lock for the file and lateral file drawer only (box drawers do not lock). Grommets are included standard with products in specific locations. Optional grommets may be ordered. 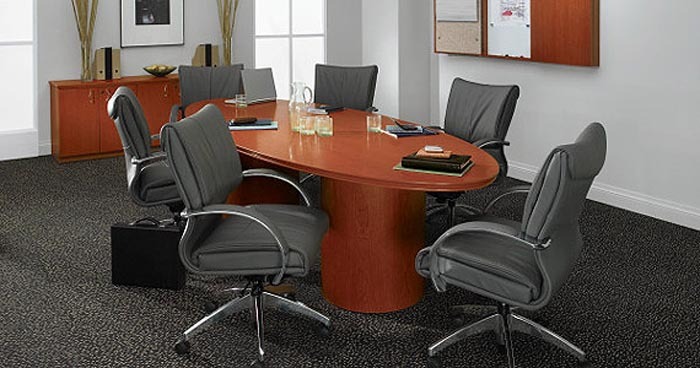 A full array of complementary reception and boardroom furnishings are available. All units are shipped assembled, unless otherwise noted.